Image courtesy of The full Comcast Customer Experience Action Plan is at the bottom of this post. 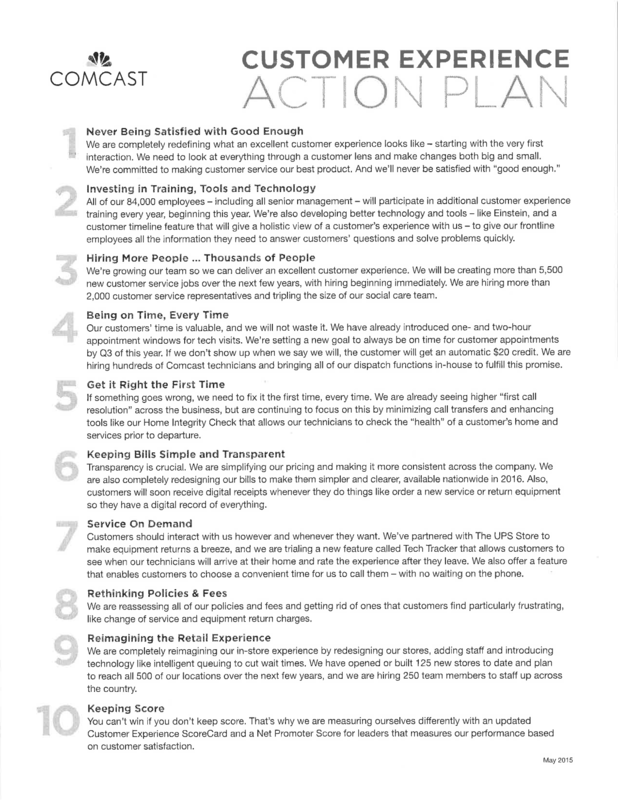 The full Comcast Customer Experience Action Plan is at the bottom of this post. For years, Comcast’s plan to win over customers was to do absolutely nothing because they — just like most cable companies — were the only choice. But with its pay-TV subscriber numbers dropping, the company is realizing that can indeed lose customers by treating them horribly. In an e-mail obtained by Consumerist, Comcast leadership has outlined its optimistic plan to win back all those customers who hate being residents of Kabletown. As mentioned in the earlier story about Comcast’s customer service turnaround plans, if a Comcast tech is late for an appointment, the customer’s account will be credited $20. The company’s goal is to “always be on time” by the third quarter of this year. Comcast says it will be hiring hundreds of new techs and bringing its dispatch operations in-house, rather than relying on various subcontracted services. No one likes calling customer service, and the dislike only grows when you get passed from rep to rep before (maybe) finding someone who can resolve your issue. Comcast says it is going to try to minimize call transfers and seek higher rates of “first call resolution.” Techs will also be performing Home Integrity Checks before leaving a house to hopefully catch any errors that might lead to someone having to come back. Comcast says it will also be giving receipts for all orders and returned equipment so that there should always be a paper trail when there’s a dispute. Next Would You Tip Your Lawyer Or Your Dentist? Next Up: Would You Tip Your Lawyer Or Your Dentist?